Aside from the complex deployment, challenging back up-restore and an difficult interface for end users, Sharepoint is EXPENSIVE! A recently released market study conducted by Information Architected found that half of the organizations using Sharepoint experienced more effort and budget than expected. While some of you might argue that you already own Sharepoint licenses, it actually requires an army of MOSS components to run along with it for a successful implementation. These components include (but are not limited to) Windows licenses, SQL Server licenses, base and enterprise CALs, Search servers and the list goes on. Add to this support, upgrade and integration costs, the total cost of ownership (TCO), overtime, simply goes through the roof. One customer who has now successfully implemented cyn.in, was initially deciding between Sharepoint or cyn.in to be used as their collaboration platform. Listing out feature differences wouldn’t work as Sharepoint has it all. The unmeasurable stuff - like Sharepoint’s complex user interface that an average non-technical employee would find difficult to use, was not something he was willing to buy in. I used a Sharepoint Price Calculator tool developed by the folks at Bamboo Nation that gives a good ballpark estimate of total licensing expenditures. 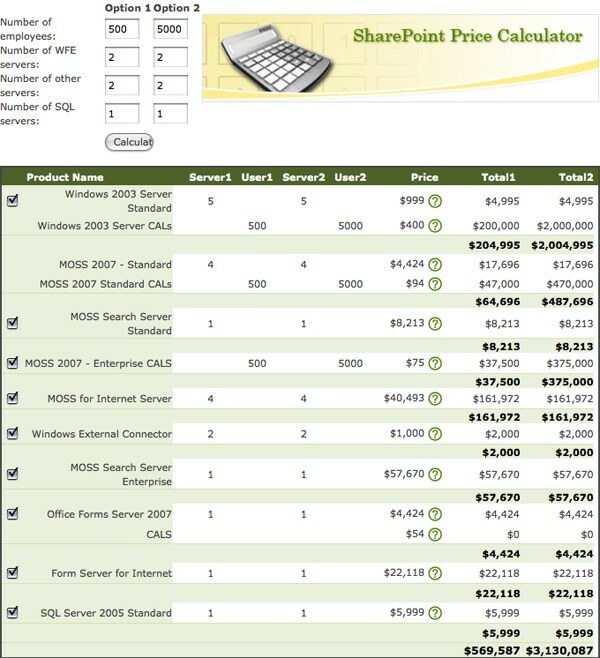 To my surprise (and the customer’s too), Sharepoint pricing turned out to be astoundingly high for a 500 user company!